Where's the first place you envision when you hear "tea party"? I bet it's not downtown Toronto; however, that's exactly where Disney Interactive Studios decided to threw one for little old me. While I had never actually been to a tea party before, after experiencing this is one I can't help but think it's one pastime that we should bring back. Now, I don't say this because the cupcakes and crumpets were delicious and the tea cups were absolutely charming; I say this because it's the perfect way of being thrown into the world of Alice in Wonderland for the DS and Wii. Disney Interactive Studios have been working on two accompanying games for the upcoming film all of which will be due early March. 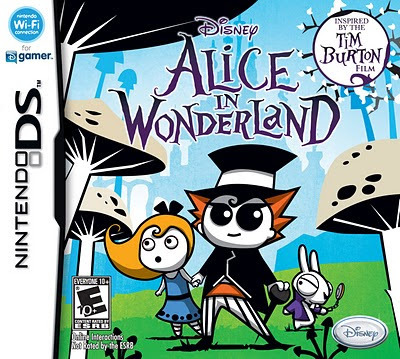 Alice in Wonderland for the DS thankfully will not be a scaled-back port of a game built for the Wii. Instead, the handheld version sports cartoony graphics, clever platform elements, intriguing puzzle design and a completely separate storyline than the one found in the movie and console version of Alice in Wonderland. Absolem, the Catepillar, has a scroll that tells the future of Underland (as Wonderland is refered to in the movie) and here is where the DS game takes place. Alice and supporting characters are sucked into the parchment and they must piece back together this world which is represented by actual pieces of a puzzle. Gameplay mixes platforming elements found in The Lost Vikings and Yoshi's Island. In both versions of Alice, the player does not control the titular hero but guides her with the handful of colourful characters (A decision that I was told was a direct request from Tim Burton) that inhabit Carroll's book. The Mad Hatter, the White Rabbit, Absolem and the Cheshire Cat can all be swapped in and out with a slash of the stylus and, in typical video game fashion, each one has unique abilities to pass certain areas. 'Unique' is the appropriate word here with gravity, time, visibility, space and perspective all being manipulated by the supporting cast. Need to get across a pit but a ledge is missing? Just get the Cheshire Cat to make it appear. A wall too large to scale blocking your way? Get Absolem the Catepillar to reverse gravity so you can walk on the ceiling. Of course, these abilities cannot be used anywhere and there are hotspots for all of the characters (that are highlighted to the player with question or exclamation marks) to strut their stuff. As limiting as that sounds, the powers still create cool effects. For example, Absolem's anti-Gs turn not only the character upside down but also the DS display. The reverse gravity space may have been small but it was cool and a little disorienting walking on the top of the lower screen. The emphasis of the handheld Alice is definitely puzzles as some obstacles will take three or more steps (usually with different characters) to get by. Our supporting cast also gain abilities over the course of the game to add even more elements to solving difficult scenarios. At one point, I saw the Cheshire Cat wall jump multiple times to get to a portal that lead to a broken clocktower which had to be turned around via the Mad Hatter's perspective power (the 2D plane literally flipped) to see the invisible gear inside which, when reappeared, would start the clock that needed to be frozen by stopping time itself with the White Rabbit. To say some puzzles are multi-faceted is an understatement. The combat portion of the game that I tried was not as strong. Stylus swipes and tapping on enemies felt loose and enemy design was somewhat uninspired. However, aspects like the world being represented by puzzle pieces (which could be arranged to have different entrances and exits between areas) and simplistic yet Burtonesque graphics were enough to make me want to play through the entire game. The Wii game however, if seen through a looking glass, or any glass, or eyeball carried the same dark aesthetic as the upcoming movie. Most characters and environments like the white Rabbit or the Red Queen's castle looked great on Nintendo's not-so-powerful box. The artists and programmers have done quite well bringing Tim Burton's imagination to life but certain things, most notably the human characters, looked kind of stiff. In spirit, the Wii game shares a lot of similarity with the DS version. You still swap between multiple characters (this time around the Catepillar sits out and is replaced by the Field Mouse and the March Hare) and each one still has unique abilities that are combined to surpass obstacles. The aforementioned environments were not just pretty to look at, they added nice touches to the 3D puzzles. At one point on the moat of a castle, the March Hare can use his ability of telekinesis to push a gear broken in half into the water. From the watery surface, the incomplete gear fuses with its reflection to create a whole cog. However, the greatest example of environment-based solutions come from the Mad Hatter. Once again, perspective was his tool (his 'unique view of life' as my game-guide Matt described it) and from special pedestals found scattered around the world, the player is able to move the camera from the Hatter's POV. "So what?" you ask. "Being able to look in 1st person view in a 3rd person action/adventure is nothing new! You should be shot!" Well Boyo, from Mr. Depp's view, you are able to able to position objects located in different parts of a room so they match up like a puzzle. For instance, in one room only half a door existed while the other half was found in a nearby picture. Even though the frame was much smaller than the actual doorway, the two were the same size from where you could look through the Hatter's eyes. And when matched up, the doorway suddenly became whole and enterable. If you've ever played echochrome, you'll know exactly what I'm talking about. One of the Hatter's podiums. 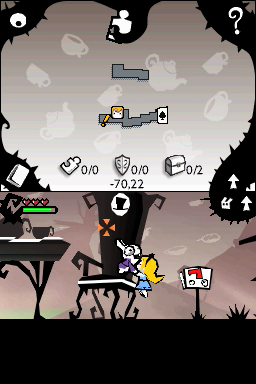 Again, while playing the Wii version of Alice, it seemed that obstacles would require various characters to be passed. However, as a E10+ game, the game is quite user friendly and all it takes is a button press to highlight all the interactive spots in one area. The hotspots are even colour coated so you know which character to use for each one. Speaking of controls, I'm happy to report that the game is not one waggle fest. Movement is controlled by the direction buttons and the camera via the Nunchuk. The pointer is used to interact with the environment and for combat. Fighting this time around is not as uninteresting as the DS version, but still doesn't feel as thought out as the puzzle elements. Abilities may be used against enemies to shake things up a bit by highlighting the baddies with the Wii Remote and this addition gives a bit of depth to the button mashing and controller shaking. One instance, I was invited to fight an obvious choice for a boss, the Bandersnatch. The large hound circled around Matt and me in a circular area that had a stone pillar in the centre. However, the pillar hid in the ground and could only be snatched by the March Hare. The beast was too fast to raise the column while he ran by so with the time powers of the White Rabbit, I slowed the Bandersnatch in order for Hare to work his magic. This is an example of the drop in and out co-op play that Alice in Wonderland supports. While there are no puzzles that are designed specifically for two players, having a friend along really does speed up certain things as I saw with my battle with the hound boss. I'm guessing that's not going to be the only area that switching between two characters quickly will be necessary. Collectibles and an achievement system have been worked into the game much to my pleasure. I was told the achievements would be like the ones found in PS3 and 360 games (story progression, exploration and being adept with skills in the game) and both games will include currency known as 'impossible ideas' that can be used to unlock new skills and buy purely decorational items. It feels like French developer Etranges Libellules are putting a lot of effort into making both Alice games better than your average licensed game. While the two versions fall into the trappings of the action/adventure checklist (half baked combat, multiple upgradable characters, bosses with one or two patterns to be memorized) the puzzle elements really do have me excited to get Alice to fall into the rabbit hole of my DS and Wii (I guess the Wii doesn't really have a hole but a slot for the disk, damn you metaphors!) I'm going to have to buy a bunch of tea, fancy British cups and a checkered tablecloth so I can prepare to bring back the awesomeness that is a teaparty and have an Alice in Wonderland night. I think it'll go over well with my manly GoW-RE5-Modern Warfare friends, don't you?